At Sekisui Heim in Tokyo-Kurohama, Japan, a worldwide leader in automated robot-driven house assembly, Thomas Spiegelhalter (Associate Professor and Co-Director of the FIU Structures and Environmental Technologies Lab) launched the book Post-Parametric Automation in Design and Construction (Artech House, 2014) co-authored with Alfredo Andia, Associate Professor. 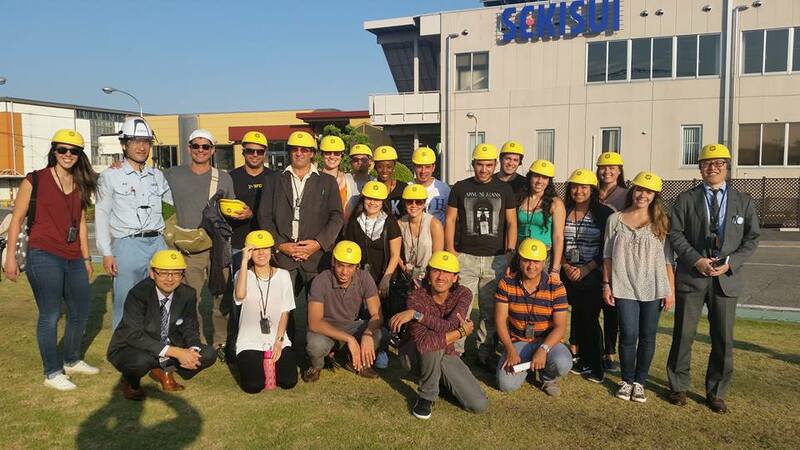 The event was attended by eighteen FIU architecture students, who went on a one-day welcome tour at the fully Automated Fabrication and Robot Assembly of Sekisui Heim. The fully automated house planning and factory tour at Sekisui Heim in Tokyo-Kurohama took place after the official handover of Professors Spiegelhalter and Andia’s co-authored book to the directors of Sekisui. The book has a designated chapter on “Automated Fabrication and Assembly: Sekisui Heim, Tokyo, Japan” (co-authored by Sekisui scientists Jun Furuse and Masayuki Katano). Eighteen Japan Abroad Summer Studio students participated in the official handover and in the half-day Automation and Robot Assembly Factory tour, which was conducted by the factory directors and scientists Jun Furuse and Masayuki Katano of Sekisui Heim. Sekisui produces around 13,000 energy-efficient, customized, and prefabricated homes per year, which range from one to three stories. Each day, Sekisui outputs approximately ten three-story houses per automation and robot assembly. The houses are then transported to the job site and assembled in only one day.